This female ruby-throated hummingbird hovers at vibrant red beebalm flowers in a garden but also takes nectar from wildflowers such as red cardinal flower and orange spotted jewelweed. Only the male has the characteristic red throat. Among the many birds that summer in Westborough are tiny ruby-throated hummingbirds, the only hummingbirds that are common in the eastern United States. Hummingbirds are the smallest birds. The ruby-throated hummingbird (Archilochus colubris) has a wing span of only 4-1/2 inches. It weighs about as much as a penny or a couple of paper clips. Ruby-throated hummingbirds are iridescent green, and males have a vivid red patch on their throats. In spite of their diminutive size, most of these little ruby-throated hummingbirds migrate to Mexico, Central America, or South America for the winter and return in the spring. They typically make nonstop 600-mile flights across the Gulf of Mexico, burning up fat their bodies have stored. They build up fat reserves before the journey, often doubling their weight. 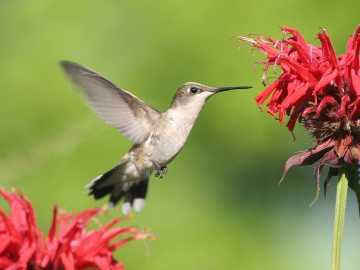 Probably the easiest place to spot a ruby-throated hummingbird is in a sunny garden full of vibrant flowers such as beebalm (Monarda didyma), butterfly bush (Buddleja davidii) or fuchsia (Fuchsia). Another likely place would be a bright red hummingbird feeder containing sugar water. Hummingbirds are also attracted to native wildflowers such as red cardinal flowers (Lobelia cardinalis) and orange spotted jewelweed (Impatiens capensis). Both are in bloom at this time of year in Westborough. The birds often nest near streams, ponds, or swamps--places where these flowers grow. If you watch a ruby-throated hummingbird, you'll undoubtedly notice how fast it moves. It may seem to stand still in the air as it hovers at a tube-shaped flower, dipping its long beak deep into the flower to drink the nectar. Then it may dart off to another location. Ruby-throated hummingbirds have remarkable flying abilities. They can fly more than 60 miles per hour. Not only can they hover, but they can also fly backward, sideways, and up and down. They can even briefly fly upside down. What's their secret? Unlike other birds, their wings beat in a figure-eight pattern. Their rapid wing motion—50 to 75 beats per second, so fast that their wings are hard to see—creates the humming sound that gives these birds their name. Hummingbirds can be surprisingly feisty and aggressive. Both males and females set up territories and defend them. Males establish territories with good sources of food that will attract lots of females. They chase away other males that enter their territory, often flashing their red throat feathers at the trespasser as a warning. Females, on the other hand, set up territories with favorable nesting sites. They defend their territories from other hummingbirds that try to feed there. They have also been known to harass hawks, crows, and other birds or predators that approach their nests. Sometimes they even try to chase away people or pets. Male hummingbirds mate with several females and do not pair up. The females build their nests and raise their young alone. Their tiny cup-like nests are about the size of walnut shells. Hummingbird eggs are about the size of peas. Females typically lay two white eggs and raise one or two broods each year. When hummingbirds feed on nectar, they pollinate the plants in the process. As a hummingbird makes its rounds, pollen gets deposited on its head and is transferred from one flower to another. The native plants that are most popular with ruby-throated hummingbirds are trumpet creeper (Campsis radicans), beebalm or Oswego tea (Monarda didyma), trumpet honeysuckle (Lonicera sempervirens), cardinal flower (Lobelia cardinalis), spotted jewelweed (Impatiens capensis), red columbine (Aquilegia canadense), Canada lily (Lilium canadense), Indian pink (Spigelia marilandica), red buckeye (Aesculus pavia), mountain rosebay or catawba rhododendron (Rhododendron catawbiense). You can see most of these plants at the New England Wild Flower Society's Garden in the Woods in Framingham (www.newfs.org), although they are not all in bloom at the same time. Non-native plants that are especially likely to attract ruby-throated hummingbirds include pineapple sage (Salvia elegans), giant blue sage (Salvia guaranitica), Cypress vine (Ipomoea quamoclit), shrimp plant (Justicia brandegeana), mimosa or silktree (Albizia julibrissin), shrub verbena (Lantana camara), butterfly bush (Buddleja davidii), rose of Sharon (Hibiscus syriacus), common foxglove (Digitalis purpurea), and cigar plant (Cuphea ignea). Hummingbirds are likely to come to feeders with a sugar solution made from one part sugar to four parts water. Red feeders catch their attention, but there's no need to add red food coloring to the sugar water. If more than one hummingbird comes to a feeder at the same time, you may see them trying to chase each other off. Besides nectar, ruby-throated hummingbirds also drink tree sap. They often get it from holes made in bark by woodpeckers known as sapsuckers. Hummingbirds also eat insects and spiders, which supply protein in their diet. Spiders prove especially useful to hummingbirds. In addition to eating spiders and spider eggs, hummingbirds steal trapped insects out of spiderwebs and take the webs to use as nesting material. When hummingbirds are stressed by lack of food or cold nights, they improve their chances of survival by going into a state of torpor. In this state they conserve energy. They can lower their body temperature almost by half, from 104-110 degrees to only 55 degrees. Their heart slows dramatically, from 250 beats per minute at rest to only 50 beats per minute. Although we usually see only ruby-throated hummingbirds in our area, there are 18 different kinds of hummingbirds in North America. Southeastern Arizona has the largest variety of hummingbirds.